HackYourPhD has been launched one year ago. Guillaume Dumas and I cofounded this initiative but the community lives and growths thanks to you. Some of you have been participating since the first event at La Paillasse in january 2013. Others have joined us later. A lot of amazing things happen during this year. We organized more than 8 events in Paris, 1 in London, and several in the United States and in Quebec thanks to your participation and the growing HackYourPhD team! We created the website hackyourphd.org with almost all articles in both French and English thanks to your help. Thanks to your participation to a crowdfunding campaign, an Open Science tour in the USA was organised and with more than 50 interviews of major Open Science actors. And you showed us your enthusiasm from all around the world. (Italia, Brazil, Germany, South Africa). This demonstrates how Open Science is becoming an important topic for all of us—researchers, PhD students, entrepreneurs, citizens. At this point, we want to create an association for HackYourPhD. 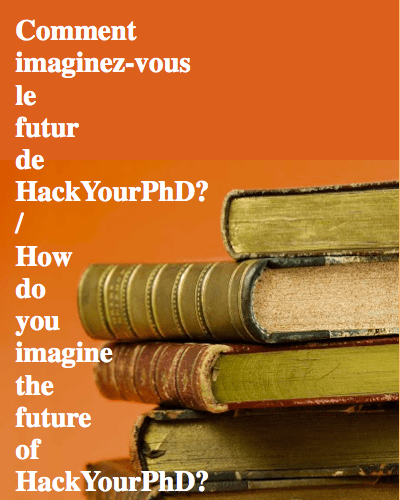 We need your help to cocreate the future of HackYourPhD. Thus, it is important for us that your share your opinion. Share with us your opinion, take our survey! Thanks for your support and do not hesitate to contact us. – to all the HackYourPhD members! Students, PhD students, researchers, designers, entrepreneurs etc..
– tor all who give us advice and support.